11.8" x 14.0" stitched on 14 count. 9.2" x 10.9" stitched on 18 count. 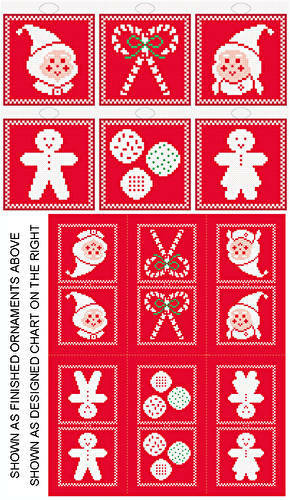 Christmas Icons - 6 Ornament Set cross stitch pattern... ORNAMENTS/GIFT TAGS - Things that make one think of Christmas, designed for 6 double sided ornaments mostly in white are included. Instructions for finishing as ornaments given.